Canadian Space Agency President Sylvain Laporte speech at the Canadian SmallSat Symposium. Credit: Marc Boucher/CSCA. 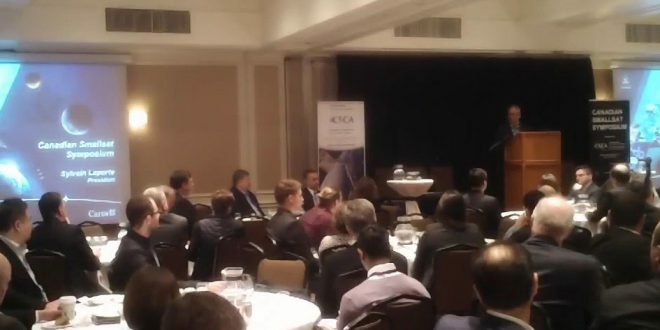 Speaking to a packed room of 200 stakeholders at the first Canadian SmallSat Symposium organized by the Canadian Space Commerce Association, Canadian Space Agency (CSA) President Sylvain Laporte signalled a new dialogue with stakeholders which is very much in tune with the openness of the new Liberal government. Mr. Laporte joked that like the new government, he could still say “new” with regards to himself as he’s been on the job for just under a year come this March. Joking aside, it’s clear that Laporte has had to deal with a lot in his first year. His appointment came after the previous president, Walter Natynczyk, was on the job for less than 16 months after being reassigned to Veteran Affairs. The CSA has a poor record of keeping its top leader in place. When Laporte was appointed, stakeholders weren’t quite sure to what make of the career civil servant. Combine that with an upcoming election, and it wasn’t certain how long Laporte would stay on the job. What the CSA needs in its leader is continuity, to start. Only Mac Evans has served a full five year term as president. The CSA also needs leadership from the Innovation, Science and Economic Development (ISED) Canada ministry. For that we’ll have to wait and see how things develop under the new government. Laporte said he was eager to hear from industry on where the space program should spend its limited resources. He emphasized that while there are a lot of opportunities in space, there is not a lot of money. Combine this thought with current fiscal situation in Canada and you might conclude hat the upcoming budget won’t see much of or any increase to the space program. Laporte also indicated he has had ongoing discussions with the new ISED minister, Navdeep Bains and that he will meet senior leadership at NASA next month to discuss future collaboration. Laporte’s first year on the job is nearly up. He’s had time to familiarize himself with the job, stakeholders and reorganize the CSA and now he has a new government that seems more willing to work with stakeholders. The coming 2nd year of his term should prove to be productive. Stakeholders are still taking a wait and see approach though and are cautiously optimistic about the near term. Getting a viable long-term plan in place with adequate funding will make them feel better about the longer term. 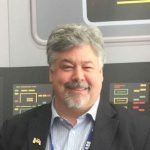 Marc Boucher is the Executive Director of the Canadian Space Commerce Association.